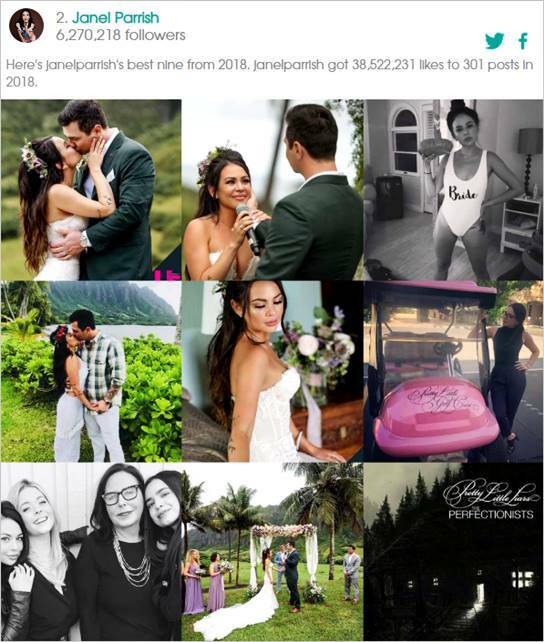 How to Create your Instagram Best Nine 2018? Because the end of the year is approaching, many of the most popular social networks give users the chance to summarize the best photographs they have taken during the year to showcase in their biography. INSTAGRAM BEST NINE 2018 – ESPAÑOL – TUS NUEVE MEJORES FOTOS DEL AÑO!! A great example is Facebook which has been providing this service for a few years now. However, Instagram has also added this feature, so we can make a compilation of the nine most popular photos of the year. If you want to use this service, known as Instagram Best Nine (Best 9 Instagram), then continue reading, because we will soon teach you how to create your own best nine in the easiest and quickest way. So everyone can see the summary of your activity. 1 How to have my Instagram Best Nine? 1.1.1 How to share this information with Best 9? How to have my Instagram Best Nine? The first thing we must do to create our own Instagram Best Nine, is to access the official Best Nine page. Once on this site, we must enter our Instagram ID or username in the box at the top; after entering this information correctly, we must click on the “GET” option, and we will go to the next point. Immediately after clicking on this option, the nine photos that have been most viewed and commented on by our followers, as well as those that have been able to achieve a greater number of likes, will appear. This way, we will be able to see which photos have had the greatest impact on other users and publish this information in our biography if we wish. How to share this information with Best 9? When this information is uploaded, the official Best Nine website will allow us to share our images, they will even recommend some hashtags that we can use if we want to. We may also share this information on other social networks such as Facebook or Twitter; just click on their respective icons. Following this series of recommendations, we will be able to share our best photos of this year, without spending a lot of time. It should be noted that Best Nine is a very useful and effective tool for us to review the activity of our Instagram, and which publications have been most successful without having to spend a lot of time. But this is not all that this application has for us, since this program also allows us to see very easily how many likes we have been able to get during the year in our photos, in addition to the number of publications we have made. In this way, we will be able to see in considerable detail how we have managed our account during the year. 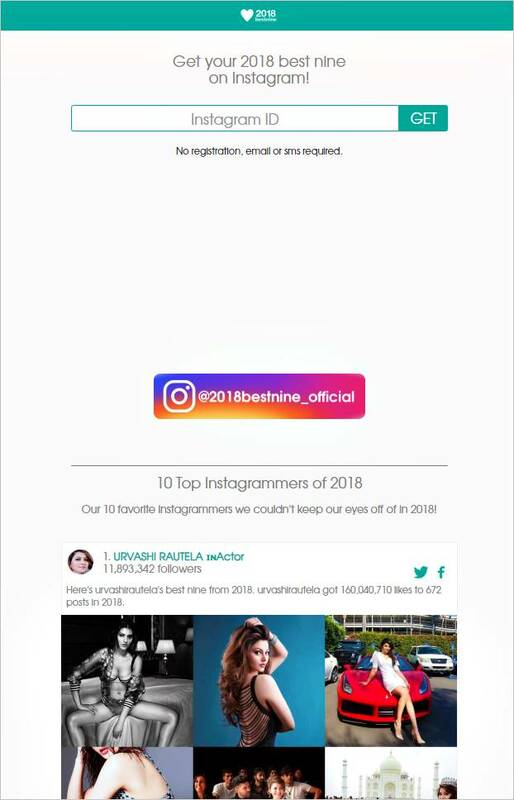 It is important to note, that Instagram’s Best Nine 2018 application is not available to all followers, because it only works with accounts that are public and do not need the approval of its users to see the content and publications they have, so if you have a private account will not work. If you want to know your activity and what your most popular publications are on other social networks such as Facebook or Twitter, then you should know that there are some applications similar to Best 9, which allow us to quickly know all these data. Bonus: We don’t want to leave without leaving you with a short video where you can watch the whole process to make your Instagram Best 9 2018. This is the fashion option to make the Top Nine 2018 automatically. Choose for you according to the likes you have received, the best photos of Instagram all year round. From your computer you can access the topnine.co website (click here), and enter your username. If your Instagram profile is opened, your Best Nine will be made directly and you will be notified by email. On the other hand, if your profile is private, you will have to log in and give permission to the application to examine your photos in Instagram. Anyway, from here we recommend that you go to the Top Nine app available for Android and iOS mobile devices. Now that this service has become so fashionable, it is possible that the web version of problems when inserting the username. 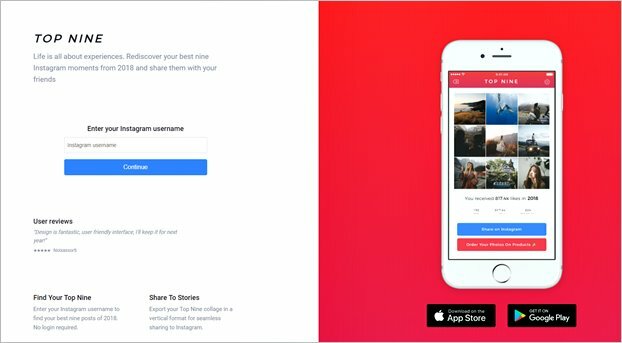 If you want to create your best nine 2018 of Instagram, you have at your disposal the app Top Nine 2018 for iOS (here) and Android (here), both can be downloaded for free. Another option is the Best Nine app for iOS (here). This has the advantage over the first one that lets you choose the year, if you want, for example, recover your 9 photos with more likes of Instagram 2017. In either case, using either of these apps, you will have to enter your Instagram username. If your Instagram profile is open, it will be done directly, but if your profile is closed, you will first have to log in so that the app can verify the “like” of your photos uploaded during 2018. When you have done so, you will automatically see the collage with your best nine 2018, which you can share in Instagram by saving it as an image in the photo gallery of your mobile device.